As we enter our fourth year of running Layups 4 Life we want to say thank you to everyone who has contributed to our success. In three years of operation we have raised over $50,000 and we would not of been able to do so without your support. 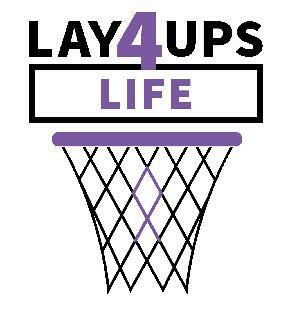 Layups 4 Life was created by Dan Exter, a former cancer patient, treated at Memorial Sloan Kettering Cancer Center. Dan was diagnosed with Acute Lymphoblastic Leukemia (A.L.L.) in the summer of 2013 at the age of 27. He received a treatment plan consisting of full body radiation, chemotherapy and a T-Cell depleted Stem Cell transplant. Dan's younger and only brother, Jason, beat the 25% chance odds and tested as a perfect match and became Dan’s donor. While recovering and laying in his hospital bed, Dan made a promise to himself. That promise was that if he was fortunate enough to make a full recovery that he would be an advocate in the fight against cancer. It was during his recovery that Dan wrote on a piece of paper the idea of creating Layups 4 Life. Layups 4 Life is founded on the principles of making a difference in the fight against cancer. It is L4L's mission to help raise vital funds for cancer research and clinical trials. The transplant procedure that Dan received at Memorial Sloan Kettering began as a clinical trial and due to its success was able to be implemented as Dan's treatment plan and inevitably saved his life.